High powered LED lamps are perfect for fine detailed tasks. 3 diopter lens with a 5" diameter viewing area. White. 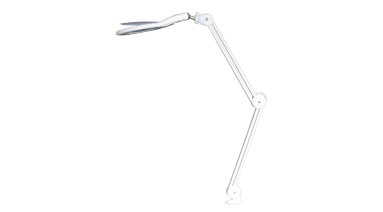 Tension control arm provides a 36" reach with an additional 13" flexible lamp head. Uses up to 90% less electricity. 6W. 450 lumens. Premium clamp mount and easy open magnifier lid.